we keep that matter most. So claims Jill Gleeson in a recent Woman’s Day article entitled How I got Rid of My Parents’ Junk Without Throwing Out a Lifetime of Memories. I agree, with a twist she did not include. 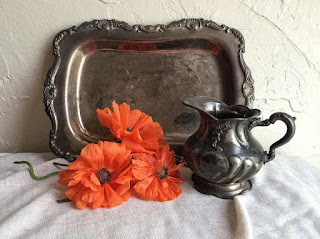 Jill wrote a poignant article that speaks to most of us beyond a certain age, and perhaps to our children who will have to deal with our collected remains, sooner or later. She describes a sorting process she went through with her father to separated junk from treasure. Still at the end of the article, it sounded like she had half a warehouse of old stuff still sitting around, waiting for her to find it a new home at some point. Take pictures and write stories! This is also a way to let family members share treasures without having physical custody. The stereo slide you see below is one example from my family. It is one of a set of a dozen. This particular slide shows my father’s parents on a hill in western Oklahoma shortly after their marriage. Only one set of originals exists, but about ten years ago I scanned those originals, making digital copies that could be printed if anyone cared. My brother has the originals and lots of us have copies. My siblings and I know the story of these slides. Our children might, but it’s less likely they’ll mean anything to later generations. That’s where Story comes in. In a nutshell, that story begins with my grandfather’s early fascination with photography, both stereo and standard. The story threads its way down generations to several of my grandchildren who are avid photographers today. I’m now prompted to wrap those slides in a PDF story package about the history of photography in Ben Melton’s family. This photography story spans generations. A picture of my mother’s favorite broach would be more specific. I might include details of how she wore it to church and how lovely it looked on her green crepe wool dress, and how thrilled I was when she let me wear it on a special date. If you click the Stories tab on the menu bar above and select Grabbing Granny's Dishes, you can read a story with a picture of my grandmother’s ivy dishes that now live in my cabinet and the rest of the family can share via pictures. The story tells how I got them too, which makes me smile each time I lift them off the shelf and remember that event. It’s also worth including pictures of ordinary objects like black Bakelite dial telephones or saddle oxfords. How about various cars your family drove? Your old bike? You can find these photos online to create a digital family museum archive. Clean out your closets and attic, basement, or garage right now. Celebrate your memories in photos and stories. Clog hard drives rather than closets and keep the memories alive as times change! I’m gobsmacked. I pulled up this picture of my kid sister in that ancient stroller/ walker. I planned to stick it in an email to a cousin to illustrate a story snippet about our grandfather and my dad the day they poured a big square concrete pad in that back corner. I was three at the time, and I remember that while he smoothed concrete, Granddaddy smelled like whiskey and cigarettes, the point of my story to Cuz. That pad served two doors, the one you see, and one you don’t. The second should be around the corner to the left. That second door opened into the dining area. Or so I’ve always thought. Until today. I strained toward my screen in bewilderment. Where is that door!? I KNOW it was there! Holy cow! How can this be? I mentally scramble inside that small dining room on a day before my mother and grandmother knocked a wall down while the men were out hunting. Before the wall came down, Mother had her sewing machine in that room along the soon-to-vanish wall. Until this very minute, I would’ve sworn to you that the door was behind her left shoulder as I sat facing her on the floor to her right, making tangles in thread while trying to sew. Okay. I get it. The door was never there. I edit it out of memory and the picture still looks right. My earliest memories are in that Albuquerque house where we lived until I was six. This is not the first mind-shattering discovery about memories of that yard. Previous pictures have shown my sandbox was not where I remembered it being, and a willow tree did not have two of its four trunks amputated. What gives? Does it matter? In the case of this house, yes. It matters to me to stick with the evidence and note that my memory was different. Since I have no emotional attachment to the earlier memory, it’s an easy switch. If no evidence is at hand when my sister and I remember a room color differently, I might flip a coin or stick with my version. If details change the truth of the story, they matter. When it does matter . . . If I discovered I was wrong about something I was emotionally invested in, something that did change the truth of a story, things would become more complex. Using a hypothetical example, let’s say that while Nora was settling her father’s estate, she was stunned to discover documents proving that her mother was his second wife. He’d been married for several years and divorced before he met Nora’s mother, and furthermore, Nora has half-siblings she never knew about. That extreme example would set off a hurricane of memories and emotions ─ and maybe research ─ leaving a new story in its wake. In stories about her father, Nora may choose to honor her original memories of her dad as a staunch church member and strong advocate of family values, then reflect back on them in the light of what she’s learned and what it all means to her. Perhaps her story would focus on how things changed. But if she wrote stories exclusively within the period before learning this fact, she may choose to write from the perspective of what she believed to be true at the time. So whether you remember wrong or learn something new, memories morph. When you discover discrepancies, it’s your choice whether to make that discovery part of your story or the focus of your story, or to honor the truth of the memory that shaped your life and made you who you are. It’s your story. Write from your heart and be true to your Story. With respect to family history, legends are those stories that survive through generations, like Grandfather Flynn was a Methodist circuit rider, or Uncle Roger fought with Pancho Villa, or Grandma Flowers single-handedly fought off Indians with an empty gun while her husband was out plowing. The legends tend to be headline length and seldom have much substance. They contain the hook of a good story, but more often than not, the story has come off the hook. If you like the legend, you may prefer to keep the hook and forget the story, and that’s okay. Just know it’s a choice. If you’re a stickler for facts, you’ll check things out, and that’s getting easier to do. The clipping above is related to a legend about my maternal grandmother. I’ve known most of my life that she (not my grandfather, but she) was a delegate from New Mexico to the Republican National Convention in both 1952 and 1956. I was proud of her for that. Somewhere along the line I heard that she started the New Mexico Republican Women’s organization. Last summer while visiting a cousin, I copied the clipping above. A couple of days ago I found the copy and took the time to read it. That clipping seemed to validate the fact that she really was head of Republican Women. Turning to Google, I discovered that Stockton ran for Governor in 1954, and the Republican State Convention took place the end of February that year. So the picture was surely from that Convention. I flashed back to a memory of a thumbnail story my grandmother told me in 1987, 33 years after that picture was taken. We were talking about her involvement with the Republican Women and she said, “Ed Mechem (a long-time family friend who began his first term as governor in 1951) asked me to help him get them started and I said yes.” That’s not much of a story now that I think of it, and it has a lot of holes, but I didn’t notice that at the time and didn’t think to ask questions. So I clicked over to Google and discovered that a huge movement was begun in 1952 to get women to vote for Ike. That muddied the water floating my legend. I felt stymied. After finding her contact info online, I shot off an email to Jo Mitchell, current president of the New Mexico Republican Women. I included the clipping and what I thought I knew about my grandmother, including that “fact” that she worked with Ed Mechem to found the NMRW. Jo promptly sent a long and thoughtful reply explaining that the organization actually bean in 1939 and that Rene Dinsmore’s name was not on the complete list of presidents. Furthermore, Jo pointed out, the article does not say what she was elected chairwoman of. Most likely she was the state chairwoman for the party. If she’d been in charge of Republican Women, she would have been elected president, and not by the State Committee. As state chairwoman, she would have gone to the convention. That makes sense. I’m grateful to Jo for the time and effort she put into her reply. I love the helpful spirit I generally find when I ask for this sort of help. Her explanation makes total sense. Discovering the communication disconnect doesn’t damage the story. On the contrary, the revised version is more consistent with my perception of my grandmother, so I’m pleased she set things straight. This small disconnect is a perfect example of how we hear through the filters of what we already know – or think we know. I thought Grandmother was involved with Republican Women, so I heard her explanation that way and read the news item from that perspective. We hear a tidbit and our imagination goes to work, embellishing or coloring in details. Over generations, these legends may shape shift like messages in the game of Telephone. In the end, what does any of this matter? Not much. I enjoy untangling stories, and I enjoy writing and telling them. I like to tell my grandchildren about my grandparents and older ancestors to connect them with history and help them feel rooted in a sturdy tree. I want them to know that our family has survived, one way or another through thick (many ancestors were wealthy a few generations ago) and thin (the Civil War and the Great Depression depleted those fortunes). I want them to know that many of their ancestors started with nothing or less and went on to thrive and enjoy success. I want them to know that many of us, perhaps most, have dared to be different and march to our own drummers. I like to stick as close to the facts as I can, but I do admit that I will let at least one family legend stand unchallenged. I love the legend too much to risk deflating it. So I explain that it may be fiction when I tell it, and include the evidence of why I think it could be true. What about you? What family legends do you cherish? What about those you don’t? Have you hit the web to look for facts? Do tell! Jot a comment now and stories for your family. Write about a painful memory for twenty minutes a day for three days, and your stress levels will go down, your health will improve, and you’ll live happily ever after! Myth or magic? Well, okay, the living happily ever after part is definitely myth, but the rest? Today, for me, it all feels like a myth. But how can it be? I’ve been a True Believer and a perpetrator of this advice for years. If you look at the menu bar below my header, you’ll see a link to an archived blog titled Writing for the Health of It. Hundreds studies have been done around the world validating successful outcomes for even short bouts of expressive writing. That is NOT a myth! However, I just ran into a personal brick wall. Over the last couple of weeks I’ve spent at least twenty hours fine-tuning and polishing a story about how a nurse practitioner in a local hospital blew off my reports of pain and gave me a meaningless, fluff diagnosis. Had he asked even two probing questions instead of jumping to conclusions, surely he would have caught my predictable, textbook case of pericarditis hours after pacemaker surgery. While I cannot prove anything beyond the words he wrote in the record I accessed through my online portal, I am 100% certain that if I’d known what I actually had, I would have avoided landing back in the hospital four months later with what became life-threatening complications. I might have had recurrences, but they could have been simply handled without more than $300,000 in medical costs and two months of non-productive time. My anger knew no bounds when I finally felt well enough to start digging around in my records to make sense of it all and found his words there in black and white. I have filed a formal complaint that’s now under review by The Compliance Process Committee. It’s too late to change my outcome, but I hope to avoid future mishaps like mine for others. I had also hoped to find personal peace and resolution through writing. That has not happened. began writing. So what do we do when writing apparently fails to help? I have a hunch that I expected too much too soon. The writing to heal research is full of admonitions about not writing too soon. We do need to let things mellow. I thought I’d done that, but now I see otherwise. My fingers began to fly the minute I read that report! I still want revenge! And that is never a good place to write from, at least for the public. Also, my anger was amplified last week when, three days after my discovery, my husband had a completely different life-threatening experience in the same hospital. And my daughter is facing brain surgery three weeks from today (in a different hospital, than heavens!). I keep missing my supportive writing groups too. Yes, my score on the Holmes and Rahe Stress Scale is currently near the top. It’s too soon for me to be writing polished accounts and expecting closure. I needed the polished account for the review process, but aside from that, I should stick to journal entries and breathing deeply. And not reading news reports about Russia or North Korea! I shall sit with my anger and fully experience it. I’ll let insights like the one about wanting revenge surface. What else will I learn? Have faith in the process and don’t stress if it takes more than three days. And stay tuned. I’m contacting others who have survived writing trauma-based memoirs. I shall share their wisdom with you as it accrues. And please, if you have thoughts or experiences to share, post a comment, or email me at ritergal (at) gmail (dot) com. Being a writer is my dream. But I can’t afford to take writing classes. Anyone who makes words visible on screen or paper is a writer. You do not need to be published. Your local library is full of books about how to write. The web is full of blogs, tutorials, newsletters, free webinars, and other resources to sharpen writing skills. Whether you can afford to take classes or not, find a local writing group. I summarize their benefits in this post. Do a web search to look for a group, and also ask at your library. All the dozen-plus successful memoir/lifestory writing groups I’ve been involved with have been library sponsored. Keep an eye open for free or nearly so classes. Senior centers and community colleges are likely locales. Online writing groups may be as good or better than local ones. Check sites like the ones on this list for free on-line writing classes targeted to specific skill topics. 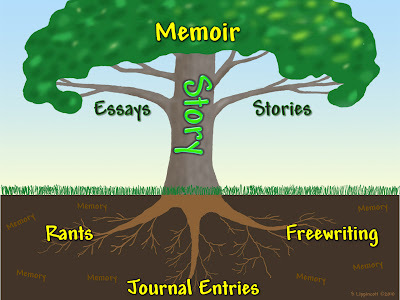 Search for “free online memoir writing courses” to find free classes and groups. Caveat: free classes are often a come-on for pricey follow-up classes and/or coaching services. Take advantage of what you can get and keep expectations low. So, you see, you can learn to write well with an empty wallet. Don’t put it off. Start now. Eventually you can even publish for absolutely free via CreateSpace and Kindle, though you’re likely to attract more readers with a small investment in a good cover and some editing beyond what your writing group and beta readers can give you. Your own efforts are perfectly acceptable for limited family and friends’ distribution. Beyond any thoughts of publication, WRITING IS GOOD FOR YOUR HEALTH. I’ve written extensively about that, especially in my archived blog, Writing for the Health of It. Now you know an empty wallet is no excuse. What else might be holding you back from following your dream of becoming a writer? Image by Damon D’Amato, http://ow.ly/vzrI30f4kMT, used by permission via Creative Commons license. Today marks the 16th anniversary of the attack on the World Trade Center. Who can forget? I heard it on the radio as I drove to a meeting. At first I thought it was a retrospective of some old show like War of the Worlds. But no. It was real. We cut our anxiety-filled meeting short to dash home to the news. I sat near the TV with my laptop for days, getting news on both channels while my thoughts and guts churned. That’s thumbnail account does little to convey the emotional impact of the day and season, but it does note my involvement and hint at the event’s impact on me. Where were you? How did you hear? What did you do, think and feel? Write it down! I’ve already written those stories. I wrote them to let my descendants know I was there and how they affected me. I want to make the events real in a personal way, to let younger generations know history is a collection of dots that live in people’s guts. Perhaps one day I’ll expand on those stories, including detailed description and my perspective over time, and tie them together into a coherent memoir (probably mini). Or maybe not. Loose short stories are valuable in their own right. So where were you when Big Things happened? How did they affect you at the time and now? Tell the future. Make history more than two paragraphs in a text book! If dates don’t fit in your story flow, anchor them at the end. Yesterday I had a frustrating reminder of how important this is. Read on to learn why and how to do this automatically. Inspired by yesterday’s solar eclipse on August 21, 2017, I decided to polish up my account of viewing a total eclipse in Richland, Washington on February 26, 1979. I knew I’d written the story, but it took some digging to find the file. It was buried in a story I posted online, but I don’t know when I wrote or posted it. Ordinarily this wouldn’t matter, but today it did. I know when the Richland eclipse occurred. That date is in the story, and I verified it online. I also refer in that document to an eclipse in Hawaii “about ten years later” that friends traveled to watch. Again, I was able to nail the date for that one online as occurring on July 1, 1991 – about twelve years later, not ten. I have no clear idea when I wrote and posted that container story that begins with a mixed reference to celebrating Christmas and watching an eclipse in partial form in clear Pittsburgh skies while it was cloudy for some others. The original file date is 2010, but I know that’s wrong. That date signifies when I moved the file to a new hard disk. My best guess is 2003, but I’ve searched the web and can’t find anything about any USA eclipse during the early 2000s and my memory of that event has faded to the point I could doubt my own words in that story. I created this template using fields, a mysterious function few of us ever need to learn, though these particular ones are simple enough. The Created date is unchanging. The Edited date updates each time I resave the file. In each of these cases, you click on the Insert tab and select Date & Time. Select your preferred date format. The difference between the two is the Update Automatically option on the right of that menu. Check to see that it’s cleared for the Created date and selected for the Edited one. The file name field is a little different. It’s also on the Insert tab, but in Word 2013 you’ll find it under Quick Parts > Field. Scroll down the list to FileName, then select your Famat option. You can, if you wish, add the full path to the filename. That used to be helpful, but today, search functions are strong enough that the filename is enough without the path. If you have a different version of Word, you can easily find out how to insert these fields using the Help function or a web search, specifying your version. To create this template, add your name, the filename filed, Created date field, and Edited date field to a blank document, leaving a couple of blank lines above. Format them as you wish. I like to reduce the font size a couple of points and italicize it, but that’s merely personal preference. You can add dingbats or anything you wish. You can align it to the left margin. Suit yourself. Then save that blank document, but not as a .doc or .docx. After you name it, click the Save as type: field directly below the file name and select Word Template (*.dotx). This will place your new template in your Documents folder in a Custom Office Templates subfolder. To use the template to begin a new story, in Word 2013 select New on the file tab, then select Personal from the line above the template icons. You’ll find your new template there. Select it and write your story. This all sounds way more complicated that it is. The five or ten minutes you may spend mucking around to create this template will ensure that you’ll know when you first wrote a story. It would have solved my dilemma today. If you forget and begin a story in a standard file, no problem. Just copy it all: use Ctrl+a)to select all, then paste it into a new template page and resave. A few days ago I spent some quality time alone with my 11-year-old California granddaughter, a rare treat. We started looking at family photos, which led to stories and questions. Lots and lots of questions, the kind that belong on Story Idea Lists. I began helping her break things down. I handed her the copy of The Albuquerque Years I’ve been keeping on a shelf for when she was old enough to read and appreciate it. That’s the mini-memoir I wrote of my preschool years, and it was the naïve, off-the-top-of-my-head project that lit my enduring passion for lifestory. You can download a copy from the Books tab above. Next she began peppering me with questions such as “How did my mom and dad meet?” I wasn’t there, but I think they met in a lab. You’ll have to ask him for more details. “How did you and Grandpa meet?” That one I could answer. Now I realize that asking all my grandchildren, and also my children, to pose questions on a continuing basis can result in the most valuable, relevant, and interesting document possible. For now I’ll answer each question in the form of a letter or Flash Memoir (see Jane Hertenstein's Memoirous blog for more info about flash memoir). Most likely each one will result in more questions. But how hard can it be to answer questions? Uhm, some could get tricky. The questions are likely to get deeper over time and stray into territory I may find uncomfortable. We’ll cross that bridge when we get there. Ruth Pennebaker is taking a similar approach in her Love, Coco XO blog. This blog is a series of letters that began when her granddaughter Ellie was born way up in Seattle two years ago. Ruth is sharing her insights and passions about life, love. feminism, politics, and whatever she thinks Ellie should know as she grows old enough to read and understand. The main difference between Ruth’s blog and what I’m setting out to do is that Ellie is too young to pose questions, so Ruth writes about her current passions and inspirations. That can work well too. Ruth has a string of published books. Perhaps we’ll see Letters to Ellie one of these years. Right now Ruth is posting on a blog. I’ll probably stick to short documents I can attach to emails. This collaborative approach could be your main memoir thrust, or it could supplement projects you may have underway. Have you written anything yet in response to family questions? Tell us about it! Grammar Check is not perfect, but it keeps improving, and I’ve come to rely on it as a polishing tool. The short video above gives you a bird’s eye view of how the combination of Spelling and Grammar Check work in tandem. Until recently I ignored the Grammar Check function in Word, because only a small percentage of the items it flagged were relevant, and my writing style is, well, some might say quirky. That has changed largely changed. My writing is still quirky, but Grammar Check gets that better. The percentage of relevant flags has improved to the point they are all worth considering, though some will still be off-base. Whether I’m working on my own document or someone else’s, I polish the piece as well as I can the traditional way. Then I click over to the Review tab and click Spelling & Grammar to check grammar. I leave it off while I’m writing for two reasons. It’s distracting, and it can stifle creativity. Grammar Check is rule bound. Spellbinding phrases may transcend rules. Give your Inner Artist free reign. Write with colorful creativity, then use Grammar Check to tweak the results rather than stifling them. I keep Spell Check on all the time, but only run Grammar Check as a last pass tool. It picks up easily missed things like periods outside quotation marks or missing Oxford commas. It alerts me to passive sentences. Or not. You can set the factors you want it to check. You can select a specific one, or you can activate all 35. Depending on what I’m working on, I use about six. This next video shows how to select which factors to activate. This is especially helpful for rechecks where you only want to check one or two things. These videos are based on Word 2013. You may find slight differences in older or newer versions. Never forget that any time you have tech questions about software, YouTube is an entire university at your fingertips. Some videos are more helpful than others, so if you don’t find an answer on your first try, watch another. When you look at the list of options, or read explanations in the Review panel that opens on the right side of your screen, you may see things you don’t understand. Look them up. You will always find the answer online. Use a search engine, not the help button in Word. You may decide you won’t bother with this step because you plan to pay an editor. Please understand that your editor may well be using these same tools, and you can save time and money by doing this yourself so your editor can focus on what really matters. A few times I’ve been baffled about what the heck a client was trying to say. That invoked an additional round of editing and extra charges. Grammar Check would have red-flagged those areas, saving that client lots of money and both of us frustration. You can find other grammar checkers online. Grammerly.com may be the best known and gets high ratings. Teachers often use it to check student work for plagiarism, but that won’t be a problem for you. It’s now available as a free Chrome extension. I have not used it, so can’t personally vouch for it. My documents are usually long, and pasting them into an online checker seems tedious, to say the least. But it may work well for you. Rather than give you review links that may soon be out of date, I suggest you search for “online grammar checker reviews”. Here’s to clear, flowing rivers of writing, thanks to the help of sophisticated digital editors.
. . . when fate brings old friends back into our lives, there is always a reason. They may act as messengers, reminding us of a part of ourselves we have forgotten to nurture. They might appear to give us a chance to react in a new way to an old situation. They may even bring up unresolved issues so that we may complete them, giving us the chance to move forward on our life path. Write on Madisyn! She attributes the reappearance of old friends to fate. But who cares how we explain it? You don’t have to subscribe to any particular belief system to see that however they reappear and whatever the reason, they can indeed offer learning opportunities. In fact, so can casual acquaintances and arch enemies. I have good news. You do not have to have direct contact with these people to learn from them. They don’t even have to be alive. Memory is enough, perhaps even better, because it reflects only your reaction and reality, and that’s something you can work with. You can safely meet anyone on the page. What happened to cause me to feel that way? Was it something I did or someone else? Would I feel the same way if it happened today? What do I know now that I didn’t know then? How have my attitudes and beliefs changed? What would I do differently if a genie gave me do-overs? Use the list as suggestions. Each situation is different. Chose your questions to fit the occasion. I do recommend writing by hand at this early stage. Research has shown that writing by hand activates most of your brain while keyboarding engages mainly the frontal part. Hooking in those extra brain cells is likely to trigger richer memory and detail and flesh out the heart of your story. Keyboarding is fine for the craft. When you feel finished with questions, you’re ready to turn your responses into story, incorporating insights you gained from the list. For example, nail the original memory with something like, Trixie called me a coward. I turned and walked away so nobody would see me cry. Then add insight and proposed do-over: Eventually I realized that she was a bully, and I should have stood my ground. Today I’d ask, “Trixie, I’ve never seen you do that. Go ahead. Do it. Show me how brave YOU are.” Or something like that. I’d speak calmly, but firmly. When you write your version, flesh out the scene with more context and detail to give readers a full experience. At least two powerful things are likely to result from this exercise. First, the new power response will be embedded in that memory, probably forever. Each time you recall that event, you’re going to feel stronger, some would say healed. Then, assuming you share your story with your writing group, family members or friends (and that’s strictly voluntary), they are likely to benefit from your insight. They may remember and re-view a similar circumstance to their benefit. Or they may learn from your example and be better prepared to deal with a situation that has yet to arise. Come to think of it, I feel ready now to write about a dysfunctional company I worked for twenty years ago. If I had written about it then, I would have done so primarily from a victim perspective. Today, after years of sporadic journaling, I realize how naïve I was at the time and see many things I could have done to improve at least my corner of that messy world. Twenty years ago I thought of writing an exposé, but I was afraid I’d sued by that major corporation. Writing from today’s more informed perspective, I’m certain I could safely publish a compelling, beneficial account. But the moment has passed. My memory of that time has dimmed, and other stories seem more compelling. I’ve learned what I need to know and that’s enough.